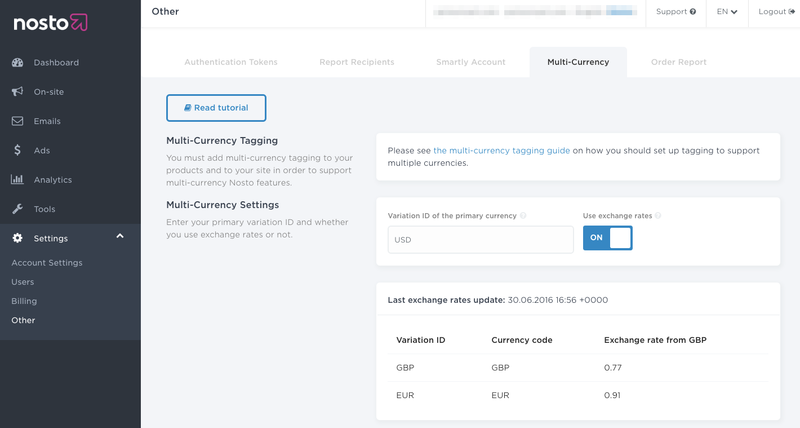 In this article, you will learn how to implement Nosto in a multi-currency environment if you are using a third party exchange rate service and frequently update product price information. 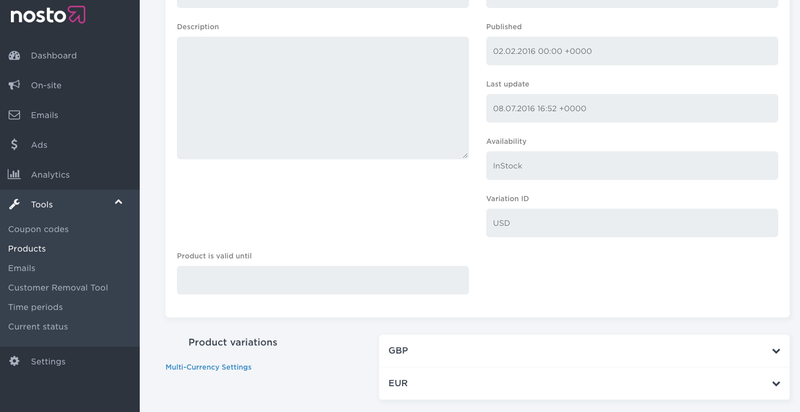 When the implementation is completed, you will be able to display product price in different currencies to relevant target groups. Note: Nosto doesn’t provide any exchange rate services. Prior to the multi-currency specific implementation, make sure that the Nosto tagging is correctly in place. The Nosto Tagging Guide can be found here. Once the tagging is correctly applied, data exchange occurs and Nosto tracks behavioral events and updates product catalogue information in real-time. However, tagging must be slightly extended to achieve an advanced multi-currency implementation. An additional span tag must be placed within the product page tagging with a classname variation_id. The tag is a child element of the nosto_product div tag. Once you have extended the product page tagging, a separate and additional div tag must be added to all the other pages (including the product page itself). The tag shouldn’t be encapsulated in the nosto_product div tag. The information sent in the tag refers dynamically to the currency active on the user’s browser. You have to set-up API calls between your system and Nosto to inform our services about the exchange rates currently in use on your website. The exchange rates must be included within a JSON message and an authenticated HTTP request must be executed. An API Token is required to communicate with Nosto’ servers. Please contact support@nosto.com to get an API Token. Please inform our Support Team about your Nosto Account ID and request an API_RATES Token. Note: The request must be made in HTTPS exclusively. You can view your API token value by signing up to your Nosto back-end at https://my.nosto.com and go to Settings > Other > Authentication Tokens. 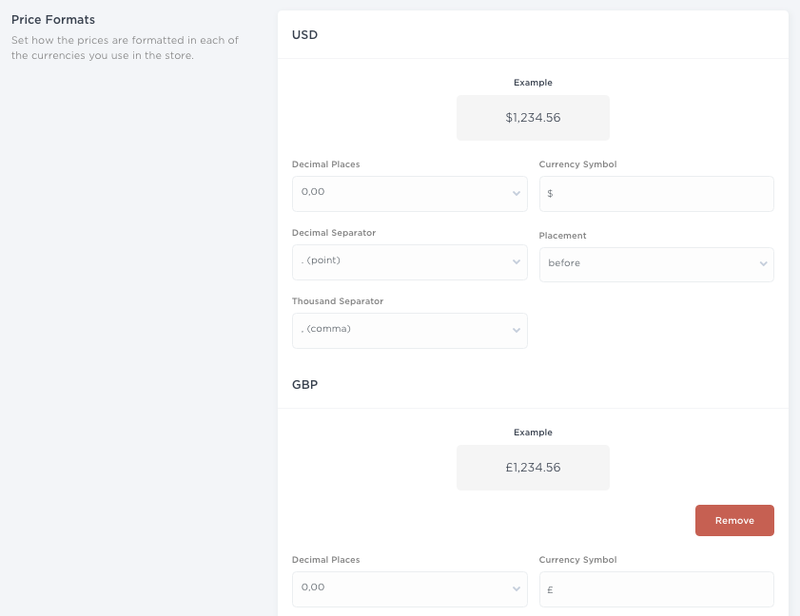 In the example above, 0.77 is the exchange rate to get the price value in British pound from US Dollar and 0.91 is the exchange rate to get the price in Euro from US Dollar. The valid_until entry defines the expiring date. When the expiring date is reached, the exchange rates won’t by applied anymore and prices will be hidden for all the secondary currencies. This is a security process to prevent displaying outdated prices. When Nosto recommendations are loaded, exchange rates are dynamically applied to the price variable in use in the recommendation templates. The variable is $!product.price.